Deficiency of sodium and water causes shrinkage both of the interstitial space and of the blood volume and may have profound effects on organ function. SYMPTOMS are variable. Thirst, muscle cramps, nausea and vomiting, and postural dizziness may occur. 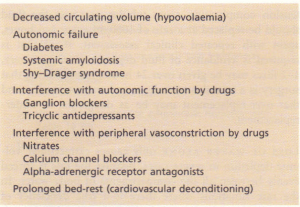 Severe depletion of circulating volume causes hypotension and impairs cerebral perfusion, causing confusion and eventual coma. POSTURAL HYPOTENSION. Normally the blood pressure rises if a subject stands up, as a result of increased venous return due to venoconstriction (this maintains cerebral perfusion). Loss of extracellular fluid prevents this and causes a fall in blood pressure. This is one of the earliest and most reliable signs of volume depletion, as long as the other causes of postural hypotension are excluded. Low JUGULAR VENOUS PRESSURE. In hypovolaemic patients, the jugular venous pulsation can only be seen with the patient lying completely flat, or even head down, because the left atrial pressure is lower than 5 cmH20. PERIPHERAL VENOCONSTRICTION causes cold skin with empty peripheral veins, which are difficult to cannulate, just when the patient needs intravenous therapy the most! This sign is absent in sepsis, where peripheral vasodilatation contributes to effective hypovolaemia. TACHYCARDIA (not always reliable). 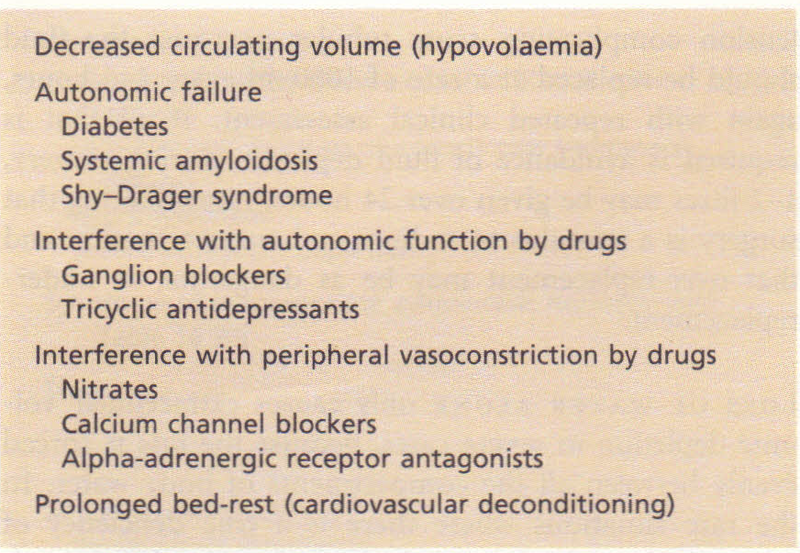 Beta-blockers and other antiarrhythmics may prevent this and hypovolaemia may activate vagal mechanisms and actually cause bradycardia. ARTERIAL HYPOTENSION. A late sign. Salt and water may be lost either from the kidneys, from the gastrointestinal tract, or from the skin. Examples are given. 1 Septicaemia causes vasodilatation both of arterioles and veins, resulting in greatly increased capacitance of the vascular space. 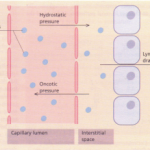 In addition, increased capillary permeability to plasma proteins leads to loss of fluid from the vascular space to the interstitium. 2 Diuretic treatment of heart failure or nephrotic syndrome may lead to rapid reduction in plasma volume; mobilization of oedema may take much longer. 3 Inappropriate diuretic treatment of oedema e.g. when the cause is local rather than systemic. 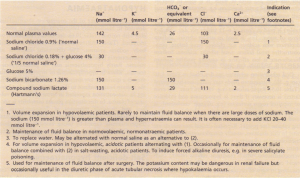 Intravenous fluids in general use for fluid and electrolyte disturbances. Blood tests are in general not helpful in assessment of extracellular volume. Blood urea may be raised due to increased urea reabsorption and, later, to prerenal failure (when the creatinine rises as well) but is very non-specific. Urinary sodium is low if the kidneys are functioning normally, but is misleading if the cause of the volume depletion involves the kidneys (e.g. 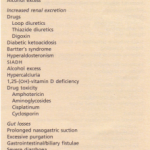 diuretics, intrinsic renal disease). Urine osmolality is high in volume depletion (due to increased water reabsorption) but may also often mislead. The overriding principle IS: aim to replace what is missing. Loss OF WATER AND ELECTROLYTES, as in vomiting, diarrhoea, or excessive renal losses, should be treated by replacement of water and electrolytes. If possible, this should be done with oral water and sodium salts. These are available as slow sodium 600 mg (approximately 10 mmol NaCI per tablet). The usual dose per day with 2-3 litres of water. It is used in mild or chronic salt and water depletion, e.g. associated with renal salt wasting. Sodium bicarbonate 500 mg (6 mmol NaHC03 per tablet) is used in doses of 6-12 tablets per day with 2-3 litres of water. 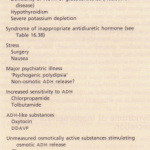 This is used in milder chronic sodium depletion with acidosis, e.g. 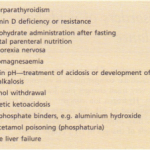 chronic renal failure, postobstructive renal failure, renal tubular acidosis. Sodium bicarbonate is less effective in causing positive sodium balance than sodium chloride. Oral rehydration solutions are described. Intravenous fluids may sometimes be required. Rapid infusion (e.g. 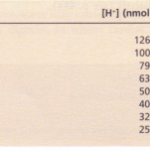 1000 ml hour-lor even faster) is necessary if there is hypotension and evidence of impaired organ perfusion (e.g. oliguria, confusion); in these situations plasma expanders (colloids) are often used in the first instance to restore an adequate circulating volume. Repeated clinical assessments are vital in this situation, usually complemented by frequent measurements of central venous pressure (see Management of Shock). Severe hypovolaemia induces venoconstriction, which maintains venous return; overrapid correction does not give time for this to reverse, resul.ting in signs of circulatory overload le.g. pul.monary oedema) even if a total body ECF deficit remains. In less severe ECF depletion, (e.g. a patient with postural hypotension complicating acute tubular necrosis) the fluid should be replaced at a rate of 1000 ml every 4-6 hours, again with repeated clinical assessment. If all that is required is avoidance of fluid depletion during surgery, 1-2 litres may be given over 24 hours, remembering that surgery is a stimulus to sodium and water retention and that over-replacement may be as dangerous as underreplacement. Loss OF WATER ALONE only causes extracellular volume depletion in severe cases, because the loss is spread evenly between all the compartments of body water. In the rare situations where there is a true deficiency of water alone, as in diabetes insipidus in a patient who is unable to drink (after surgery, for instance), the correct treatment is to give water. If intravenous treatment is required, water is given as 5% dextrose, because pure water would lead to osmotic lysis of blood cells.